It wasn’t John David Mann’s plan to become an entrepreneur, but it seems that it is destined to work that way. At just fifteen, he won the prestigious BMI Awards to Student Composers, receiving the award at the Waldorf Astoria in New York City, where he met William Schumann and Leopold Stokowski. While apprenticing as a choral conductor under his father, Dr. Alfred Mann, he had the opportunity to meet such legendary figures of classical music as Randall Thompson, Leonard Bernstein, Boris Goldovsky, Robert Shaw, and George Crumb. John’s musical compositions were performed throughout the U.S. and his musical score for Aeschylus’ Prometheus Bound (written at age thirteen) was performed as part of a theatrical production of the play at the stone amphitheater in Epidaurus, Greece – where the play was originally premiered a few thousand years earlier. At seventeen, John and a few of his friends started their own high school in New Jersey, called Changes, Inc, with many students being placed in schools such as Harvard and Yale. He joined the faculty of the school after graduation and has subsequently taught students from all walks of life. John founded Solstice, a journal on health, nutrition, and environmental issues, in 1986. His series on the climate crisis, “Whither the Trees?”, was selected for national reprint in 1989 in Utne Reader for a readership of over one hundred thousand. In 1992, John helped write and produce the underground bestseller, The Greatest Networker in the World, by John Milton Fogg, which became the defining book in its industry. During the 1990s, he built a multimillion-dollar sales and distribution organization of over a hundred thousand people. He was co-founder and senior editor of the legendary Upline Journal and editor in chief of Networking Times. A New York Times bestselling author, John’s writings have earned the Axiom Business Book Award (Gold Medal, for The Go-Giver), the Nautilus Award (for A Deadly Misunderstanding), and Taiwan’s Golden Book Award for Innovation (for You Call the Shots). His books are currently published in more than two dozen languages and have sold more than 2 million copies. The Go-Giver was also honored with the Living Now Book Awards Evergreen Medal in 2017 for its contributions to positive global change, and cited on Inc.’s “Most Motivational Books Ever Written” and HubSpot’s “20 Most Highly Rated Sales Books of All Time”; The Go-Giver Leader was listed on Entrepreneur magazine’s “10 Books Every Leader Should Read” and Forbes magazine’s “8 Books Every Young Leaders Should Read.” His 2012 Take the Lead (with Betsy Myers) was named Best Leadership Book of 2011 by Tom Peters and the Washington Post. 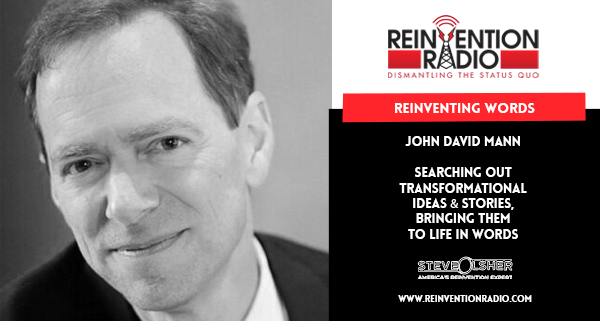 TUNE IN to this episode as John chats with Steve, Mary and Richard how he searches out transformational ideas and stories, bringing them to life in words. Reinventing Mindfulness – In this episode, Bruce Langford chats with Steve, Mary and Richard about fine tuning your focus to stay centered and grounded.